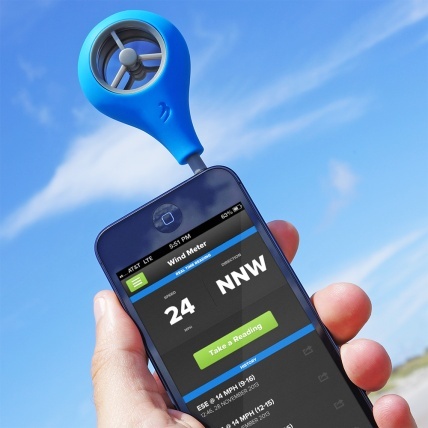 WeatherFlow Windmeter for IOS and Android Wind Meter - An Anamometer for your smart phone. 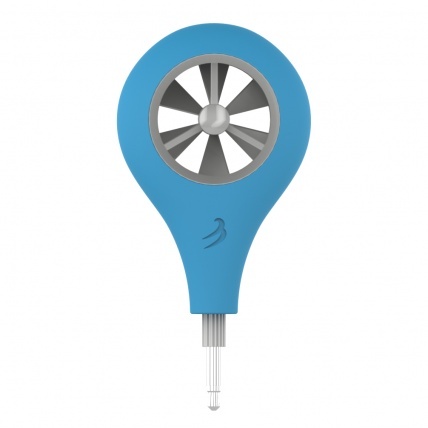 The WeatherFlow Wind Meter - it’s an anemometer that fits in your pocket. Download one of weeatherflow's free apps for iOS or Android and plug in your wind meter to the headphone port - it’s really that easy. Hold it up high facing into the wind. Your phone does the rest by recording the wind speed (average, lull and gust), wind direction and location. winds. Calibrated at the University of Florida’s Aerospace Engineering Department, our Wind Meter is designed so that even if you don’t hold it directly into the wind, you’ll still get very accurate wind speed information. Back in 2009, around the same time we started working on the first version of our iPhone app, someone said, “Hey, we should make an anemometer that plugs into your phone!” We all thought it was a great idea, and that’s what it stayed for four years: a great idea. Until today! We’re proud to announce the WeatherFlow Wind Meter - it’s an anemometer that fits in your pocket. It’s the first hardware product we have created for the general wind- & weather-addicted community. It’s compatible with iPhone, iPad, iPod, and all major Android (coming soon) devices. And you are going to love it. Download one of our free apps for iOS or Android (coming soon) and plug in your wind meter – it’s really that easy. Hold it up high facing into the wind. Your phone does the rest by recording the wind speed (average, lull and gust), wind direction and location. Easily share onsite reports with WeatherFlow, Instagram, Vine, Twitter, SMS, Email, Facebook. And view all of this crowdsourced weather in one of our consumer applications. 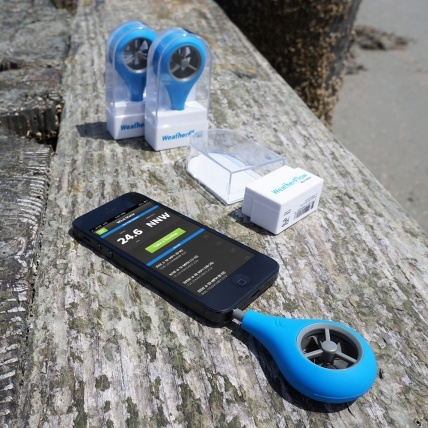 The Wind Meter, although not a scientific instrument, is designed to be better than any other handheld anemometer on the market. It’s operating range extends from the smallest puff (2 mph) to well over hurricane force winds (125 mph). Calibrated at the University of Florida’s Aerospace Engineering Department, our Wind Meter is accurate to the larger of +/- 0.5% of the reading or 0.2 mph at up to 15° off-axis. That means even if you don’t hold it directly into the wind, you’ll still get very accurate wind speed information. Not only do we have one of the most accurate and coolest handheld wind meters on the market, at £29.95 it’s also one the most affordable.